Part of the mission of Men Having Babies is to promote surrogacy practices that minimize the risks and maximize the potential short and long-term benefits to all involved; and to raise awareness about the potential benefits and meaningful relationships surrogacy arrangements can bring about. As part of our mission to promote surrogacy practices that benefits all involved parties, MHB is in the process of devising a framework for ethical surrogacy principles, protocols and best practices for intended parents. In November 2015, the first draft was published after receiving approval by our Board and our Surrogates Advisory Board. We are collaborating with several community organizations to translate this document to several languages and collect feedback. Selected issues from this framework will also be brought up for discussion and public comments at our upcoming conferences. As part of our mission, Men Having Babies is proud to collaborate with researchers worldwide in recruiting gay surrogacy dads or dads-to-be for credible academic studies. Our Research section lists the studies we approved, and we also help recruit candidates by notifying the members of our Speakers Bureau and general mailing list. Leading these collaborations is Dr. Jeff Parsons, a member of our board and the Chair of Psychology at Hunter College, who over the years has been conducting LGBT health-related research in various capacities. Academic researchers may contact us with requests for such collaborations (see page for details), or for requests to access the rich statistical data we collected in our surveys. For details, see our Research page. We often find that positive surrogacy stories go untold, while the press is much more likely to report when things go wrong. As a growing number of gay men turn to surrogacy to create families of choice, the practice started to receive more visibility. Gay men are naturally less likely to hide the origin of their children than their straight counterparts, and therefore in many countries they are at the forefront of advocacy efforts to highlight the potential benefits of this practice. To further assist in this trend, Men Having Babies has launched the first ever Surrogacy Speakers Bureau. 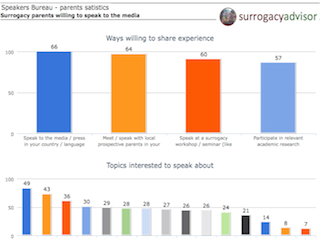 Prospective speakers are identified through our parent survey initiative. As of September 2012 we already have in the database over 100 couples and singles, most of them parents, and some still in the process of creating their family. While most are gay, we also have some straight couples as well. For detailed up to date reports, and to make inquirers, see our Speakers Bureau page. In addition to a private Facebook group dedicated exclusively to current and future gay surrogacy dads, we created the MHB Surrogacy Forum Facebook page for the larger community of people who were touched by, and benefited from gay surrogacy arrangements -- including gay dads and their families, surrogates and their family members, egg donors, and the professionals who help facilitate the process. We welcome bloggers from all these backgrounds to comment and contribute to the forum. Financial implications: while this may be a growing practice, surrogacy is still very expensive and financially out of reach for many. We feel this should be not just noted, but also combated (which the organization does through financial assistance and other means). Relationships: we believe surrogacy arrangement are more successful when attention is given to the meaningful relationships they can bring about. Well being of all parties: we believe that attention should be given to the way surrogacy arrangements should minimize the risks and maximize the potential short and long term benefits to all involved - including the surrogate and donor, their families, the prospective parents and the future children. Our workshop and seminars regularly touch upon the issue of minimizing the risks involved in surrogacy, maximizing the short and long-term benefits to all involved, and the importance of meaningful relationships it can bring about. Our video library has several clips form such seminars, and relevant content can be found in our articles library.